Revelation 12:11 says, “They overcame him (Satan) by the blood of the Lamb and by the word of their testimony.” We overcome first by salvation: entrusting ourselves to Jesus, and second, by the word of our testimony. Our testimonies are the many ways in which Jesus has walked us through the trials and tribulations of life. They are the places in which we have entrusted ourselves fully to His saving grace and in turn, He has entrusted the treasures of His character, grace, mercy and love to us! “I have given them the glory that You gave Me, that they may be one as We are One,” John 17:22. In John 3:19-21 when Nicodemus comes to Jesus at night, He tells him, “This is the verdict (the judgement), Light has come into the world, but men loved darkness instead of light because their deeds were evil. Everyone who does evil hates the light, and will not come into the light for fear his deeds will be exposed. But, whoever lives by the truth comes into the light, so that it may be SEEN plainly that what he has done has been done through God.” Testimony! A lamp is a great illustration of a radiant believer. Without Jesus, we are all dead lamps, but once we become saved, we’ve been plugged into the power source of God – all His riches are waiting there. 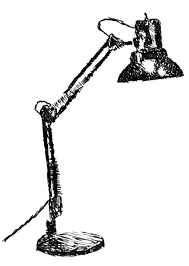 But in order for a lamp to have light, it has to be switched on – engaged with it’s power source. Many Christians are plugged into Jesus – they have salvation, but they haven’t learned to switch their light on through the power of the Holy Spirit by seeking daily to live in His presence. “Blessed are the poor in Spirit, for theirs is the kingdom of heaven,” Matt 5:3. Blessed are those who realize they have nothing in themselves to offer the Lord, we are all poor in Spirit – we don’t have it! Once we admit this, the Lord can fill us with His Spirit – the true power to radiate light! Is He good, or what?! Just the very thought that He – the God of the universe would entrust His reflection to me, or even long to do so is amazing! “But we all, with unveiled face, beholding as in a mirror the glory of the Lord, are being transformed into the same image from glory to glory, just as by the Spirit of the Lord,” 2 Cor 3:18. So, go, and radiate the light, testifying before men all that the Lord has done in your life! I think we all doubt at times if the Lord is working or moving in our lives, but I’ve found if I take the time to stop and reflect in prayer, I begin to see that He never stopped orchestrating. Last year I started a ‘Sovereignty’ journal that I plan to fill with testimony of God’s goodness, grace, refining fire and love for me. I continue to be amazed at how clearly the Lord’s hand holds my world together. It is truly becoming a book of testimony. One that can be passed down for generations to come. We must also understand that God makes all types of light. In our homes we have multiple light sources, but each is important and plays a unique role – from the chandelier in the dining room to the nightlight in the back hall. We tend to admire the chandelier and think we could never be of use like ‘them’, but it’s often the nightlight in the back hall that keeps people from stumbling. God doesn’t make mistakes, and He has a purpose for every light! I needed this encouragement today. Thank you my friend!